Contests and Prizes – 3 Ways to Win! 1. Meet the Sponsors and Exhibitors! Visit all of our exhibitors to learn about their exciting technologies and educational offerings and get “stamped” as you go! Collect stamps from all to be eligible to win an iPad or gift cards. Be sure to pick up your sponsor/exhibitor stamp card when you pick up your name badge to participate in a fun activity and have a chance at winning a new iPad Wi-Fi 32GB. 1. Visit each booth to collect a unique stamp. 2. Cards should be turned in at the OLC Booth (#100) no later than 3:15pm Thursday. One Grand Prize winner will be drawn from those who collect ALL the unique sponsor and exhibitor stamps to win. Grand Prize: iPad Wi-Fi 32GB. Additional prizes will include a variety of gift cards. Minimum of 30 stamps must be collected to be eligible for gift cards; full card must be stamped to be eligible for iPad drawing. Winners will be notified by email and Twitter on Thursday afternoon. Winners can claim their prizes at the conference registration desk before 12:30pm ET Friday; otherwise prizes will be mailed. Stop by the OLC Booth (#100) to enter to win a totally-tubular Back to the Future gift bag filled with your favorite 80s toys and treats, and $50 in OLC gift cards! One grand prize winner will be chosen randomly and will be notified by email after the conference ends. Twitter – Follow us @OLCTODAY. Then, using #OLCAccelerate, Tweet about conference colleagues, peers, and speakers who are inspiring you. Instagram – Workshops, sessions, innovations! Show us what you’re enjoying this week. Tell your story with images posted on Instagram using #OLCAccelerate. Facebook – Like us at facebook.com/OnlineLearningConsortium. Then post pictures or networking stories from the conference with #OLCAccelerate. Prizes will be awarded based on highest number of posts, the most tweets from a post, funniest post, most unique post, and other randomly chosen posts. Be sure to take and share a photo of the best swaps that you receive and tag with #olcaccelerate! Sponsors for prizes listed below. Pick up a detailed flyer at the registration desk or at the OLC exhibit booth and JOIN THE FUN! #237 Looking to create videos for your educational institution? 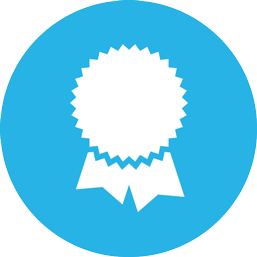 Screencast-O-Matic is awarding 5 free one-year deluxe subscriptions to OLC members. Screencast-O-Matic’s deluxe subscription enables you to take your video up a notch and create amazing videos with an intuitive video editor. Add text, moving animations and more! #206 SmarterServices will contribute $50 to the charity of the winner’s choice. 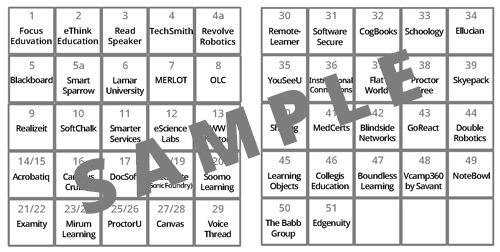 #332 We will be giving the winner a free license to Yellowdig for one academic year. Join us each day for Yoga with Janet, a fellow conference attendee and certified yoga instructor. * Slow Flow Yoga – Ready to start the day energized? Join us for a 1 hour Slow Flow yoga class with Janet, a fellow conference attendee and certified yoga instructor. Slow Flow yoga is made up of slow flow (three breaths per posture) including sun and/or moon salutations. Comfy clothes needed; bring your water bottle. We will provide towels to use if you don’t have a yoga mat with you. Note: Attendees participate in yoga classes at their own risk. In the unlikely event of injury, please note that OLC and the WDW Swan & Dolphin Resort may not be held liable. Don’t forget to stop by these exhibit booths to enter your name in booth prize drawings. Need not be present to win (except where noted). Winners will be notified by hosting sponsor or exhibitor. #246 Get scanned to be entered to win 1 of two $100 Amazon gift cards. #249 AirPods – Apple AirPods are great for just about everything. These wireless headphones connect with all your Apple devices, activate when you put them in, and capture your voice perfectly. Swing by booth #249 for a chance to win! 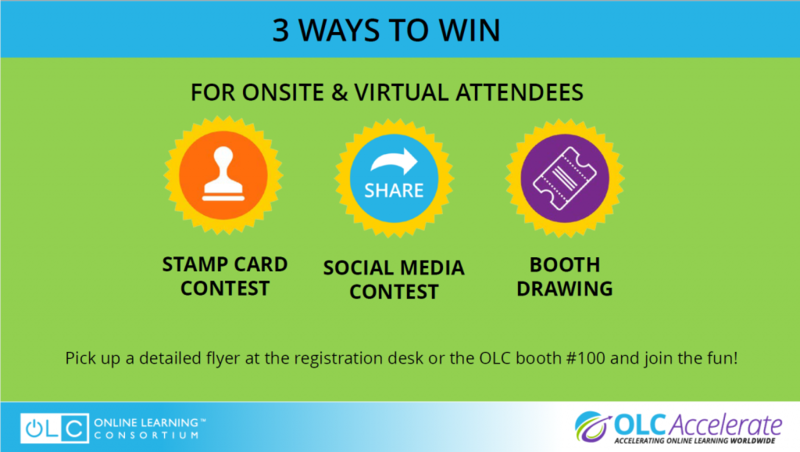 #100 Stop by the OLC Booth (#100) and enter to win an 80s Back to the Future-themed gift bag with $50 in OLC gift cards! Note: Participants must bring their Proctorio door tag to the booth and staple their business card to enter. Prizes will be shipped to winners. #200 Echo Dot (3rd Gen), Amazon’s most popular voice-controlled speaker. Ask Alexa to play music, answer questions, read the news, check the weather, set alarms, and control compatible smart home devices. #237 Create personalized videos with a green screen! To celebrate one of Screencast-O-Matic’s newest recording features, the company is giving away green screens to 5 lucky winners at OLC Accelerate. Take it to the next level and enhance your videos by removing your background! Visit Screencast-O-Matic at booth #237 for more. #206 As a part of the contest that will be promoted on the door hangers, we will be giving away a Fuji Mini Polaroid camera and an Amazon Echo. Both are valued at about $50 each.